Hymer LPG tank fto UK fill adaptor - GAS IT Leisure Gas Bottles, Gas Cylincers and Gas Tanks - Catering, Motorhome, Campervan, Caravan, Farrier and Road Repair Refillable Gas Solutions. If you have a refillable gas tank fitted with the Acme fillpoint as used in Germany or as fitted to a German, Hymer or older VW Motorhomes then this GAS IT long, heavy duty fill point adaptor will fit into the internal threaded part of your existing Acme fillpoint and allow you to fill in the UK or Holland. This adaptor simply screws into the inside threaded section of the Acme fillpoint via its internal threaded 21.8 RH section (see our product pictures to check your Acme fillpoint) and converts it to UK bayonet and thus can be refilled at any UK filling station. 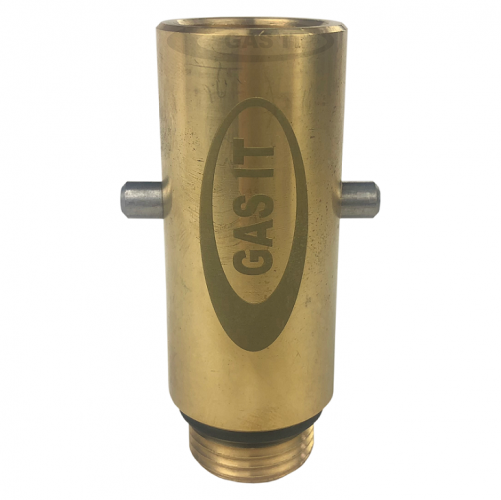 The overall length of this GAS IT adaptor is approx 75mm so its long enough to extend the UK gun clear of the existing tank fittings with ease. This Acme adaptor comes with an internal thread on the bayonet side so you can simply screw a Italian/French adaptor (sold separately) and then fill up in all countries selling autogas around Europe. We always advise checking your Acme fillpoint has an internal thread before ordering this part.